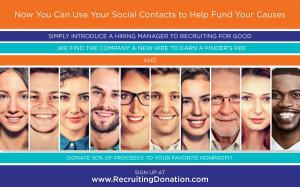 Recruiting for Good is sponsoring Recruiting Donation; rewarding referrals to companies with 50% of proceeds to help fund churches, nonprofits, and schools. SANTA MONICA, CA, UNITED STATES, October 12, 2018 /EINPresswire.com/ — Recruiting for Good is sponsoring Recruiting Donation to reward referrals made by people who help connect the staffing agency with hiring companies; with funding to donate and help support causes people care about most. When a hire is made, and a finder's fee is earned 50% of the proceeds will be donated to a U.S. based nonprofit. According to Recruiting Donation, Founder Carlos Cymerman, "Our purposeful service is perfect for individuals, couples, and moms too who donate to nonprofits. You love to give more, but can't; because of financial responsibilities (paying off a college loan, saving for a house, or taking care of the kids)." 1. To get started introduce your best friend, dad/mom, husband/wife, girlfriend/boyfriend, nice neighbor, or son/daughter who loves to support your causes…and works for a company in the U.S. (or an executive at a company that you personally know a CEO, CFO, CIO, COO, or VP of HR). 2. When Recruiting for Good gets retained for a search, finds the company a great employee, and earns a finder's fee. 3. Recruiting for Good will donate 50% of the finder's fee to a U.S. based church, nonprofit, or school. Carlos Cymerman adds, "Together we do more…Want to experience life differently? Join us to use your social contacts for good; and make a greater impact in the world. We are using recruiting for good, helping people find great jobs; and rewarding referrals with fun purposeful life experiences." Recruiting Donation is a purposeful service for people who love to support their causes. Simply make a referral to help Recruiting for Good connect a person to a job; when a fee is earned 50% of proceeds will be donated to a U.S. based church, school, or nonprofit. We are all socially connected…now people can use their social contacts to impact the world, and benefit their life. www.RecruitingDonation.com join us to experience life differently, love life, and party for good. Recruiting for Good is a socially progressive staffing company in Santa Monica, finding talented professionals great jobs, since 1998. Companies retain us to find the best talent in Accounting, Finance, Engineering/IT, and Marketing/Sales professionals. We reward referrals with fun life experiences. 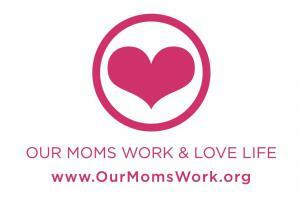 We sponsor www.OurMomsWork.org, and our founding members of Co-Op Celebrating Women. "We use recruiting placements to fund Our Moms Work, Santa Monica based community service: creating fun services, and purposeful parties that change lives."